There is a great array of uses for medical respiratory devices. One of those areas includes the operating room. If you have undertaken the task of sourcing for vacuum pumps for respiratory devices, look no further than Airtech Vacuum Incorporated. Assisted respiration: spontaneous breathing effort is merely supported by the respiratory device, with a set overpressure. Controlled respiration: the patient’s respiration effort is fully assumed by the ventilator, with preset respiratory volume or pressures. Modern respiratory devices have the ability to automatically adjust both the exhalations and inhalations to the patient’s unique needs. Respiratory devices are also available in an array of versions – as mobile home respiratory devices, long-term respiratory devices for intensive care applications, and emergency respiratory devices for rescue applications. Respiratory devices that are used to treat patients with lung diseases are usually equipped with gas ring blowers. They need to compress the air for breathing, filter it, and then enrich it with the prescribed medication or oxygen. Today, side channel blowers are can also be found in half stationary or portable respiratory devices. Why Choose Airtech Vacuum Incorporated For Respiratory Devices? Our customers come to us for custom-made vacuum and blower technologies including oil-free vacuum pumps, high pressure regenerative blowers, variable speed blowers, rotary vane pumps, and more. Since 1982, Airtech Vacuum Incorporated has placed our customer’s needs on top of its priority thus providing unmatched technology to serve varying needs of different industries. That’s why you can purchase vacuum pumps for respiratory devices from us with complete peace of mind. What’s more, our systems are easy to install and operate. You can rest assured that our company is certified by various industry standards namely the CSA, RoHS, CE, UL, and ISO. Our knowledgeable engineers are well-trained to analyze your unique situation and from there, you get the best pressure-based and vacuum technologies that match your industry’s requirements. 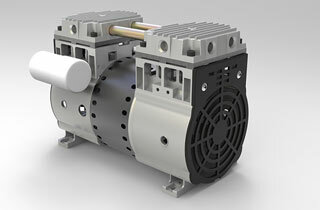 If you are in need of a vacuum pump with dry piston feature, Airtech is a name you can trust. Rest assured that your orders are also handled with utmost care and that we only produce high quality products at the most competitive rates. Start browsing through our inventory today and source for top-notch respiratory devices vacuum pumps with exceptional ease!